Dimensions 19.5" H x 10.5" Jar diam. When you require a container that makes it simple to serve guests tea, juice, or similar mixed cocktails, our "Silver Beverage Dispenser" is a must. Besides adding a beautiful and elegant aesthetic to your decor, it allows guests to serve themselves a tasty drink. The brushed-steel exterior will fit into any decor and is sure to dress up any bar or buffet table. 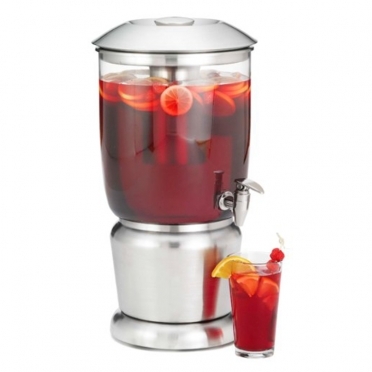 Thanks to the removable infuser and ice core, all your drinks will remain chilled and delicious throughout your event. 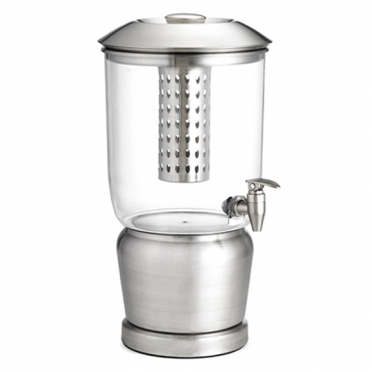 No matter if your celebration will be held inside or outdoors, this dispenser will be a valuable item to include.